Train, eat, sleep, repeat. With that philosophy and these 6 pro tips, you'll be well on your way toward astronomical muscle growth! You leave every sweat session feeling like your body has no choice but to grow, yet weeks pass and your scale and strength numbers seem to suggest otherwise. You may start to feel dejected by the thought of not getting the results you were expecting, but take heart: Help is here! You need a firm game plan to maximize your workouts and time in the gym. So, who better than a panel of "gains-perts" to help you focus and guide you toward success? Like you, these fitness professionals have put in plenty of work, and they&apos;ve also hit points where they felt like giving up. The difference is that they&apos;ve fine-tuned their approach to counter stalled progress before it happens, allowing them to implement appropriate size-building tactics. Using these six vital tips, you, too, can maximize your gains! Athlete Craig Capurso prefers training in the evening, especially during a mass-gaining phase. "By placing my workouts at night rather than in the morning or early afternoon, I can load my meals prior to training, and shuttle more fuel toward that workout for performance and recovery." With his fuel stores topped off, Craig achieves a much more productive workout at night than if he trained earlier in the day without sufficient energy. If you really want to see gains, get a few meals in you before your workout, and don&apos;t skimp on the post-workout carbs—even if you train late in the evening. Placing carbs around your workouts is a great way to fuel performance and encourage recovery. For many people, the training sweet spot lies sometime between 4-7 p.m. Any later than that runs the risk of disrupting your sleep cycle. Remember that quality sleep helps repair your muscle and ensures more positive anabolic effects. "Your muscles grow in your sleep and at rest, not in the gym," explains bodybuilder Calum von Moger. "Natural hormones are released in your sleep and will help you recover, getting the results you just worked so hard to obtain." In addition, von Moger also recommends that you drink a casein protein shake before bed, shooting for 20-40 grams of casein. Even while asleep, your body utilizes some protein overnight, so it&apos;s important to keep your levels of this critical nutrient high. "This will provide a trickle of amino acids to fuel your muscles while you sleep," he explains. Some people often place too much emphasis on food while they neglect other needs, like proper hydration. "Your body is made up of 70 percent water, which means water plays a key role in your everyday function and peak performance," von Moger explains. "For athletes, staying hydrated is critical for performing at the intensity necessary to build lean muscle." Drink and sip water throughout the day, during fat-loss and muscle-building phases. It&apos;s possible to confuse hunger with insufficient hydration, so it&apos;s especially critical to stay well-hydrated when cutting fat. Drinking plenty of water is even more crucial during and after a workout, since even slight dehydration can actually limit your performance. Aim to drink at least 64 ounces of water per day, which is about two liters. If remembering to drink water is a challenge, keep a refillable, wide-mouth bottle like a Nalgene or even a shaker bottle with you at all times. You can also set multiple daily reminders on your phone to alert you to a water break. Just as the foods you eat leading up to your workout heavily contribute to your available fuel sources, the supplements you take can provide immense benefits, as well. A few pre-workout ingredients to consider include: branched-chain amino acids (BCAAs), which are critical for muscular energy and repair; beta-alanine, which can help improve muscular endurance; creatine, which supports both size and strength; and a nitric-oxide-boosting ingredient like citrulline malate. "Before the gym, I take one scoop of Beta BCAAs, five grams of creatine, and a pre-workout product like C4," says Craig Capurso. During the workout, he sips on Alpha Amino along with 25 grams of dextrose to keep his energy high. "Once my workout is over, I also make sure to take in 50 grams of COR-Performance Whey and another 5 grams of creatine," Craig adds. These supplements help create the perfect anabolic environment for your muscles, kick-starting repair soon after your workout is over. As they say, muscles are made in the kitchen, not in the gym. Pay close attention to the balance of your diet. If you are feasting on protein and not much else, it&apos;s time to change your ways. "The notion that protein is the only important macronutrient for building muscle and strength is extremely outdated," explains Karina Baymiller. "Carbohydrates and fats are also important in the process of building and recovering muscle." "As a general rule, keep your daily protein intake around 1 gram per pound of body weight," she recommends, "and then fill out the rest of your calories with carbohydrates and fats." Do keep in mind that you want to emphasize quality carbohydrates and fats in your diet. Contrary to what some dirty-bulkers may lead you to believe, Twinkies and Ho-Hos are not ideal for supporting a growing body. Complex carbs like brown rice and sweet potatoes are solid choices, as are natural fat sources like fatty fish and almonds. However, simple carbs like white rice can play a positive role in building muscle, especially if timed correctly. On the importance of pre-workout carbs, von Moger says: "High glycemic-index carbs, such as white rice or fruit, are superior to other options [at this time], as they digest quickly and provide your body with energy to help you raise the bar in the gym." Muscles require plenty of stimuli to grow, and they require repeated stimuli to continue growing. Train at least four times per week, focusing primarily on large muscle groups. "Any less than that and you may sacrifice some gains," says von Moger, who believes in training as often as you possibly can—in a recovered state, of course. To recovery adequately between sessions, von Moger recommends spacing out your body-part training. "The idea is to split your workouts effectively so that you have at least 36 hours between training the same muscle group again," he says. Using von Moger&apos;s approach, you&apos;d train two muscle groups per session, with at least four sessions per week, to ensure optimal recovery and training frequency. You have to eat to grow—there&apos;s just no getting around this cold, hard truth. In the case of continued growth, the totality of calories is far more important than meticulous macronutrient breakdowns. Sure, it&apos;s uncomfortable to eat when you don&apos;t feel like it, but you don&apos;t have to eat a mountain of food in one sitting. The best way to get in extra calories? "Eat frequently," recommends von Moger. "If you&apos;re a three-meals-a-day kind of person, five meals may seem like a nuisance, but the results are really worth it. This [meal frequency] will help you stay anabolic, ensuring optimal results." By fueling your body more regularly, you can train your stomach to adapt to the higher calorie intake necessary to build mass. The exact meal frequency is entirely up to you, but many aspiring muscle-builders have found thatconsuming 5-7 meals per day helps them stomach all the food they have to eat. Eating every few hours can also positively impact muscle protein synthesis, which is your ticket to added muscular size. If you stay committed and hungry for success, and make sure you follow these pieces of advice, it won&apos;t be long before you see remarkable results! Share your own favorite bulking tips in the comments below. Make your first meal of the day count with these four healthy breakfast recipes from the shredded athletes of Cellucor! Everybody deals with sticking points in their muscle growth, but not everybody knows how to overcome them. 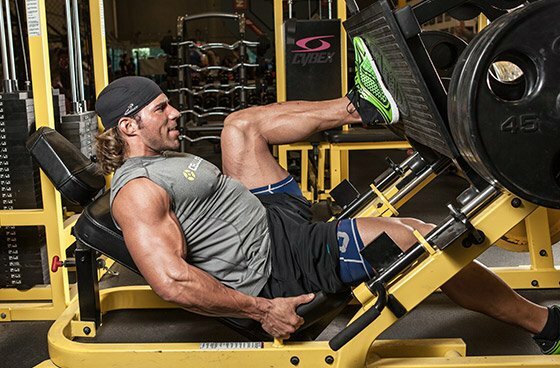 Here are 5 ways to push past stalled progress and get back to gains!